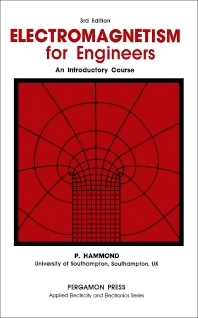 Electromagnetism for Engineers: An Introductory Course, Third Edition covers the principles of electromagnetism. The book discusses electric charges at rest; steady electric currents; and the magnetic field of steady electric currents. The text also describes electromagnetic induction; the magnetic effects of iron; and electromagnetic radiation. Mechanical and other kinds of engineers and engineering students who need knowledge on electromagnetism will find the book invaluable.